​​​​​​​​​​ ​​SAN ANTONIO – A partnership between American Landmark Apartments and Electra America has purchased the 306-unit Manor at Castle Hills from Provident Realty Advisors. Built in 2000, the multifamily property at 1835 Lockhill Selma Rd. 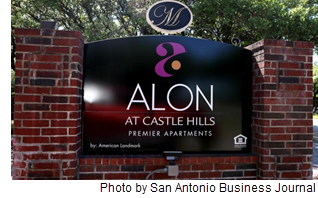 has been rebranded as Alon at Castle Hills. The Bexar County Appraisal District last assessed the complex at $38.9 million.